1 Sarah Coakley Famous Sayings, Quotes and Quotation. God', by definition, cannot be an extra item in the universe (a very big one) to be known, and so controlled, by human intellect, will, or imagination. 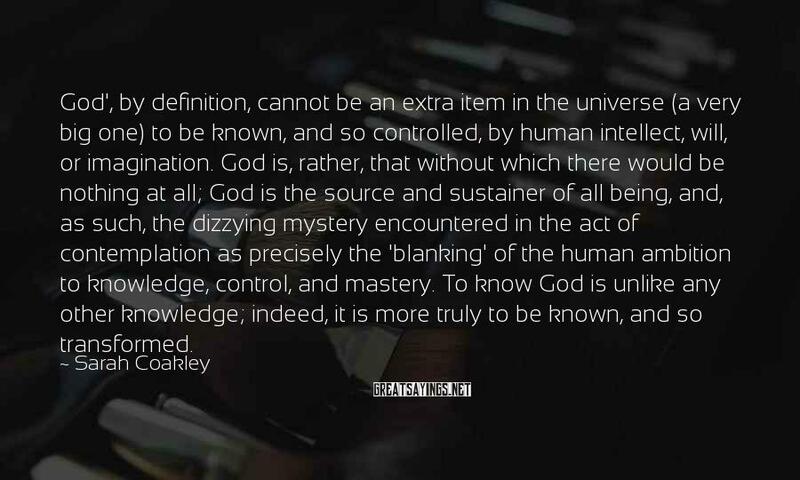 God is, rather, that without which there would be nothing at all; God is the source and sustainer of all being, and, as such, the dizzying mystery encountered in the act of contemplation as precisely the 'blanking' of the human ambition to knowledge, control, and mastery. To know God is unlike any other knowledge; indeed, it is more truly to be known, and so transformed.